Hi there. I've been enjoying my summer with my children, but am still taking some time for me to scrap. 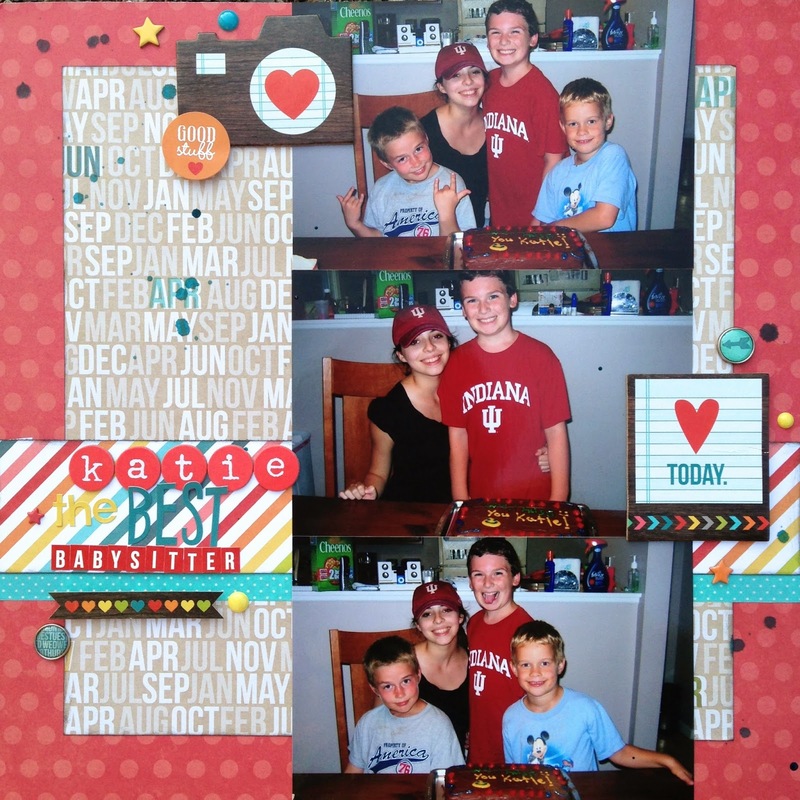 I am sharing a LO that is up on the Get It Scrapped blog. Today, we are talking about Sketches and Templates. I use sketches all the time. When I sit down to scrapbook, my roadblock is page design. I often just don't know where to begin. Sketches give me a starting place, removing the stress of designing the page. I usually have my photos already chosen. When I'm ready to begin a page, I will look for a sketch that works with them. The fun part for me is choosing my supplies. Once I have chosen a sketch, the page comes together quickly. The page is about our much loved babysitter who was going off to college. I used full 4x6 photos and needed a simple design. Here is used a sketch from the Get It Scrapped Rule Play eBook. It has a nice horizontal strip to ground the photos. The embellishments are a small way to enhance the theme of the page without overwhelming it. To make it my own, I extended the size of the matte, and used the title as the third embellishment area. Really cute page - great subject. Darling layout! Such sweet photos! Great mix of patterned papers!